Adopt an elephant for the day and even get into the river to bathe him in Thailand. Let my Alaskan bear guide introduce you to the grizzlies of Brooks Falls or Pack Creek. Sleep in a tundra buggy among the polar bears in Canada. Swim with the migrating humpback whale-Moms and their calves off the Silver Banks of the Dominican Republic. 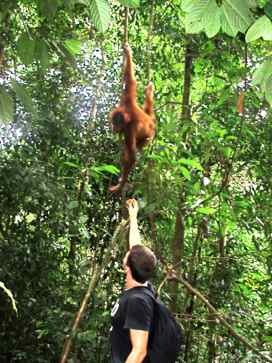 Trek into Sumatra, Indonesia’s jungles to hang out with the orangutans. Swim with manta rays in the nighttime waters off the Big Island, Hawaii.